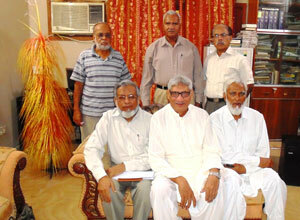 The meeting was held at the residence of Kamal Ahmed Farooqi. IAK thanked KAF who providing his house for the meeting and arranged a very delicious lunch for all the attendees. Finally; SAEEA purchased its own Sound System. SAK demonstrated functions of the system to all Managing Committee. Kamal A. Farooqi thanked to Shafiq A. Khan and Engr. SW Fakhri (Who is our very active member and very cooperative) for their efforts in buying good system. KAF further requested all the members that to use the system specifically just for SAEEA functions only. KAF highlighted the activities occurred during the month of October 2014. KAF noticed decreasing number of SAEEA paid Members and requested IAK to prepare a list of all Members for his review. He will then decide either calling or visiting the Members in order brushing their interest and attending future SAEEA functions. During SAEEA 11th Reunion, a leading newspaper announced certain giveaways items for the children attended the picnic. Furthermore, the newspaper announced good number of giveaways items for ladies, gents and children during the forthcoming SAEEA’s 12th Reunion. SAEEA will distribute children items during the forthcoming 12th reunion. SAEEA will also distribute other give away items thru LUCKY DRAW or asking certain questions amongst all attendees during the 12th reunion and then distribute gifts to qualified persons. At present we have two Ladies Representatives; Mrs. Manzoor Shaikh and Mrs. Imtiaz Qamar Khan; working for SAEEA. Members emphasized the need of a third Lady and proposed a name. KAF requested MSH to contact the family and ascertain their interest in working as Ladies Representative. It was unanimously agreed in holding SAEEA 12th reunion at the end of December, 2014. IAK informed all the attendees that SAEEA website is updated. IAK informed that a Son of SAEEA Member, who is a professional in his field, offered his services in making video and doing photography during the next SAEEA functions. All attendees agreed in giving the task to him. MSH provided details and cost of newly purchased sound system. KAF prayed for fast recovery of all sick people, especially for MSH’s mother, Iftikhar Ahmed, Anwar Mirza, G.M. Abbasi, Mahmood, Jaleel and others.